Beautiful Incentives: #MyBlogSpark #breastcancerawareness & #Win a Gift pack including $10 GC! #MyBlogSpark #breastcancerawareness & #Win a Gift pack including $10 GC! A while ago I posted about how this disease hits home to me. I also offered some awesome savings you can get at Publix, and with coupons to go along with those great savings shown here: http://www.beautiful-incentives.com/2013/10/saving-lids-to-save-lives-with-yoplait.html. You can shop for your favorite brands and help a great cause by Yoplait through doing so! If you love yogurt, than you should consider Yoplait's many great flavors. Then save the lids to those containers to donate to the cause of Saving lids for lives! Today, I am excited to offer the chance for one of my readers to Win the gift pack pictured here. 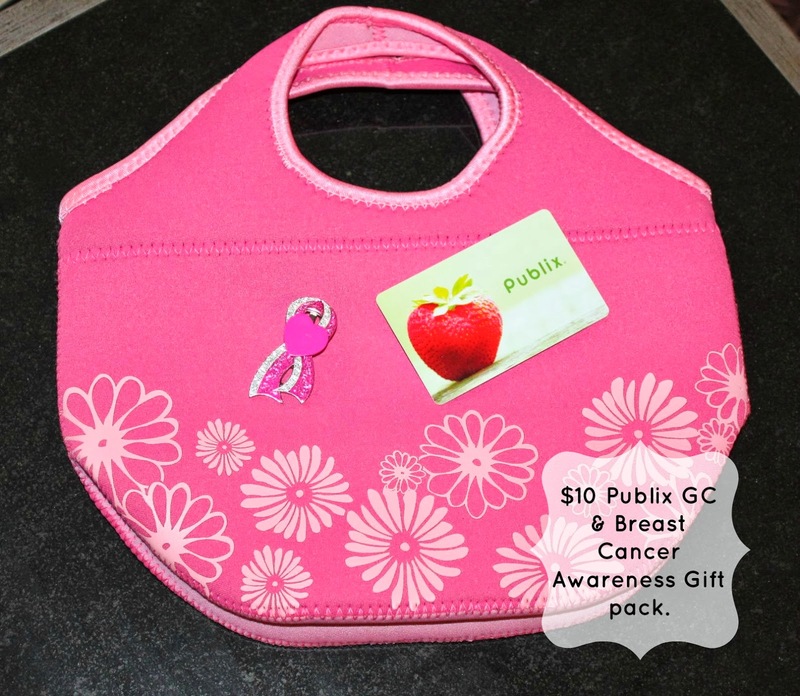 It includes: A $10 Gift Card to Publix, a sparkle ribbon pin, a heart magnet and a super cute pink flowered lunch tote! I would send this to my mom who lives right down the street from a Publix. Thanks for the giveaway! I would send this to my aunt in Nashville! I like the black forest cake yogurt by Yoplait. i would stock up on yoplait yogurt. i want to try the key lime pie. My favorite Yoplait flavor is Harvest Peach. I would use the gift card to buy a special treat for a friend that has been ill. I would buy laundry soap with the gift card if I win! Key Lime Pie is my favorite Yoplait yogurt!